Please note: the information contained below is out of date and will be updated within the coming days to reflect the changes made to Permanent Deadman as a result of content changes introduced following the Deadman Seasonals. 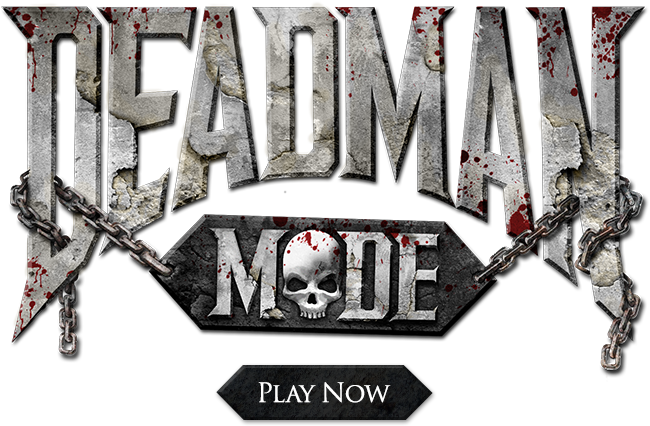 Deadman mode is an intense, player-vs-player survival game mode for Old School RuneScape. Deadman Mode is the ultimate in risk vs reward PvP. All members can use their existing account to play on the Deadman servers and compete in the hiscores to see who can survive this unique way of playing Old school Runescape. Player vs player combat is enabled everywhere! The only exceptions to this are inside the Chambers of Xeric, Barbarian Assault and Tutorial Island, and camping there isn't going to do you much good. 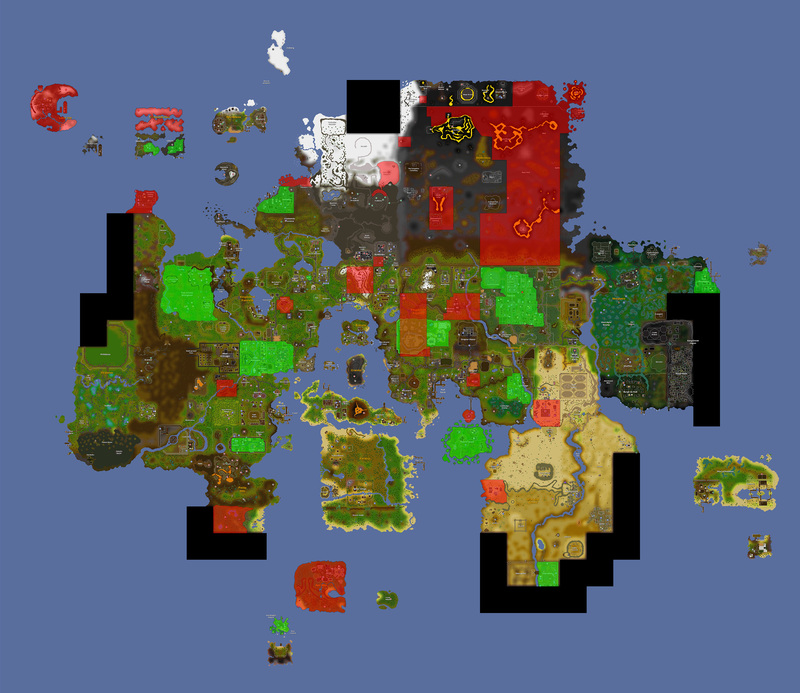 There isn't a single spot in Gielinor where PvP is not a possibility in Deadman mode. Incredibly high level guards patrol the major towns across the map keeping them safe. If they spot a player with a PK skull they will take them down in no time. The areas highlighted in green on the map to left are the safe areas. 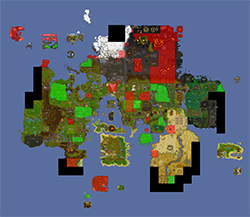 The areas highlighted in red on the map to left are multi-way combat areas. Map provided by 2007 Wiki. PK skulls in Deadman mode mean something quite different to PK skulls in standard Old School RuneScape. While they do have an impact on what happens when you die, which is explained in detail just below in the 'Death' section of this page, PK skulls in Deadman mode have a couple of other significant effects, too. In Deadman Mode, you are given a skull for 15 minutes when you first attack someone. Each subsequent time that you re-skull will add 2 minutes to this timer, up to a maximum of 30 minutes. If you attack an unskulled player who is more than 30 levels below you, your skull timer will be set to 30 minutes. Guards attack and kill players with PK skulls if they enter safe zones. Players who attack you when you are skulled will not be skulled themselves. This makes you a very tempting target. 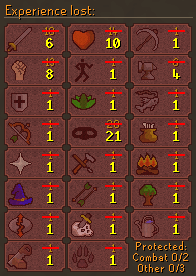 If you are in possession of any bank keys from killing players while skulled your skull will indicate how many keys you are holding. Again, making you a very tempting target. Your skull timer does not tick down if you stand still. You have to be on the move to lose your skull. A death in Deadman mode is no joke. 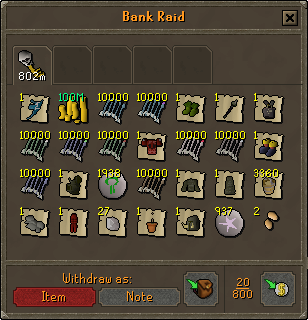 If you die to a player and you are skulled you will lose the 10 most valuable stacks of items from your bank to a bank raid, all items that you have on your person and a chunk of experience from your unprotected stats. If you are unskulled when dying to a player you will lose the 10 most valuable stacks of items from your bank to a bank raid, all items that you have on your person and smaller chunk of the experience you have gained in any unprotected skills. If you die to a monster when you have a PK skull you will lose the 10 most valuable stacks of items from your bank, all items that you have on your person and half of the experience you have gained in any unprotected skills. The amount of experience lost in all of the above situations depends on the combat level of the player killing you, with the amount lost getting lower the more combat levels above you someone is. If you die to a monster when you do not have a PK skull and have not taken damage from a player you will lose all of the items on your person except for the 3 most valuable. You will not lose experience or any items from your bank. If you die with a skull inside a guarded zone, you will lose 10% of your experience in protected skills in addition to the existing item and XP loss. If you die without a skull inside a guarded zone, you will not lose any experience in your protected skills. You can protect 5 skills in total: 2 combat skills and 3 non-combat skills. You can do this by opening the items lost on death interface from the equipment tab. If you die and lose experience, you'll be able to gain experience up to the point where you lost it at an accelerated rate. So, if you dropped from level 75 Firemaking down to level 68 Firemaking, you'd get quicker experience on your way back to level 75. If you manage to kill a player in Deadman mode you will receive a key drop. This key will give you access to a chest that holds the 10 most valuable stacks of items from the bank of the player you killed. Getting to this chest is no easy task, though. The chests are located in safe areas meaning you will not be able to use a key until your PK skull expires. If you choose to take your chances and go for a kill you will have a hard time staying alive for the time your skull lasts for. Is it worth the risk? You can protect up to 10 items by placing them in your safe deposit box. Items in your safe deposit box will not be lost to a player who kills you, unlike those found in your bank. Remember that you can only place 10 single items into your safe deposit box, not 10 stacks. The experience you gain in Deadman mode will be five times the amount you would normally gain in Old School RuneScape when training. Experience earned through quests will remain at the same rate but training using the standard methods will be much, much faster. Below is a list of the changes that we have made to minigames in Deadman mode. Barbarian Assault PvP disabled inside the minigame. The lobby is still dangerous. On December 4th the Deadman Winter Invitational will begin! The invited deadmen will have five days to level up their accounts before facing eachother in the Winter Finals on Saturday 9th December! For more information read the latest Deadman Blog. All existing RuneScape rules must be abided by during the Deadman Invitational. All existing Deadman Invitational Terms must be abided by during the Deadman Invitational. Anyone who has been caught cheating in any Jagex event may be suspended from all future Jagex events. Jagex staff will review cases and players. Players found to be abusing game mechanics to gain an advantage in a way considered by the Jagex Staff to be unsporting will be removed from the invitational immediately. Using combat with an allied player within the Deadman Invitational is considered to be using a game mechanic to gain an unfair advantage.